Several techniques from modern nonlinear optical physics and laser spectroscopy are investigated. 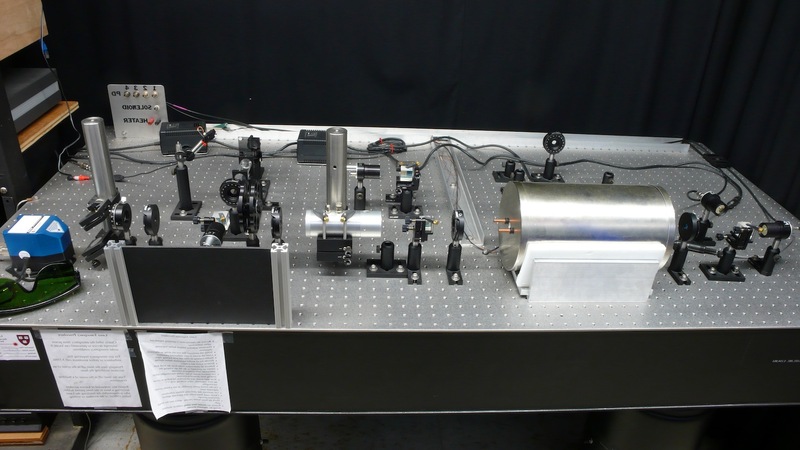 The experiment utilizes a highly coherent source of light, provided by an extended cavity diode laser, to probe the spectroscopic properties of atomic rubidium vapor, as well as novel coherent phenomena that arise from the interaction of light and atoms. Although the intrinsic line width of the optical absorption from the ground spin multiplet to the excited state can be quite narrow the observed linear line width is considerably Doppler broadened due to the thermal motions of the atoms. Using the most basic nonlinear effect, which arises when atoms whose Doppler shift matches the laser are excited at a rate that is faster than the rate at which they fall back to the initial state, it is possible to directly observe the narrower intrinsic line width of the Rb atoms. The nonlinear effect reduces the absorption in an amount that depends non-linearly on the light and leads directly to the phenomena to be studied. Proposed experiments include: a) observation and identification of Rb linear absorption lines, b) investigation of sub-Doppler non-linear resonances in a standing-wave laser field, c) investigation of the absorptive and dispersive properties of what are known as "dark-resonances" through measurement of non-linear polarization phenomena such as the non-linear Faraday effect and d) measurement of ultra-slow group velocities for light pulses, which are associated with narrow dark-resonances. Schematic illustration one possible configuration for the optical elements. The component labeling is as follows: AW is an attenuator wheel; P is a linear polarizer; PD1,2,3,4 are photodiodes; λ/4 and λ/2 are quarter and half wave plates respectively; PBS1,2 are polarizing beam splitters. The two Rb cells are labeled Rb. Applications of narrow dark-resonances include: atomic spectroscopy, high-precision magnetometry, coherent control of light pulses, and quantum information processing. The effects that are probed with this teaching lab apparatus can be understood quantitatively in the framework of semiclassical atom-field interactions, in which light fields are treated classically using Maxwell's equations, whereas atomic energy levels are considered quantum mechanically. More sophisticated extensions of the teaching lab apparatus are required for quantum information applications, whose understanding requires a fully quantum mechanical treatment of both the light fields and the atoms.